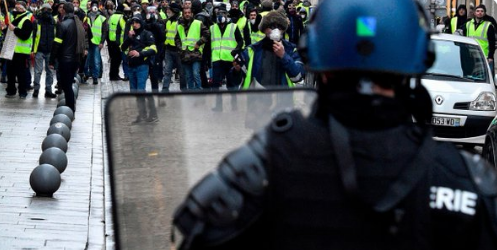 What price French socialism? That’s the question President François Hollande is being asked as he tries to reconcile his “Mr Normal” image with his unashamed courting of the multibillionaires of Qatar. Before coming to power last year, Hollande admitted: “I don’t like the rich,” and pledged a top income tax rate of 75%. That, like so many of his much-vaunted plans, hasn’t quite worked (the legislation is still in the pipeline) but his antipathy towards the wealthy has already seen some flee the country, mainly to more liberal tax regimes including the UK and Russia. In which case, those who remain ask, why on earth did Hollande look so gleeful last week on a visit to Qatar’s outgoing emir Sheikh Hamad bin Khalifa al Thani, and his Harrow-educated son Sheikh Tamim? Hollande appeared to have shed all reservations about high-end, trans-border capitalism as he highlighted the “mutual respect and understanding” between France and Qatar, encouraging the liquid gas-rich emirate to pour its petrodollars into everything from prestige Paris real estate to the city’s troubled immigrant suburbs. The equivalent of some £10bn has arrived over the last five years, with Qatari investors given every incentive to keep the cash coming, including the waiving of stamp duty on their property purchases in France. Qatar is, of course, casting its asset net across the world. You can see its influence all over the UK – from Harrods to major sporting events such as the horse racing at Ascot, through almost every new luxury development in Knightsbridge and Chelsea – but there is something extremely peculiar about the most overtly leftwing head of state in Europe becoming so reliant on the Gulf state’s largesse. While in Doha, Hollande even praised his detested conservative predecessor Nicolas Sarkozy for doing so much towards strengthening Franco-Qatari relations, portraying him as some kind of economic visionary. The reality, however, is that there’s nothing astute about cosying up to the super-rich. It’s just something that comes easily to the French political establishment, whether right or left. When I asked a senior Hollande aide how the president could square his once outspoken socialism with the financial clout of absolute and hereditary rule there was the predictable huffing and puffing about “knowing who our friends are” and “the need to be realistic”. This “realism” extends to the French supplying up to three-quarters of Qatar’s armaments. 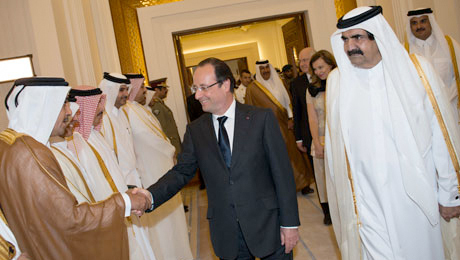 One of the main reasons for Hollande’s trip to Doha was to try to persuade the Qataris to replace their ageing Mirage fighters with Rafale ones, so signing military contracts that will be as lucrative as the ones Sarkozy wanted Muammar Gaddafi to sign for the same planes (Sarkozy failed, perhaps hastening his decision to destroy the colonel’s Libyan dictatorship). It’s all about realpolitik – something that invariably persuades politicians to betray their principles. France is certainly in crisis too, with the cost of living spiralling along with the unemployment rate. Domestic recession has combined with the eurozone slump to send Hollande’s approval rating into freefall, making him one of the most unpopular presidents in French history. But just as Sarkozy – a man once laughably dubbed the “Gallic Margaret Thatcher” – achieved next to nothing during his single term in office, apart from a kind of showbiz ignominy (the Paris home he shares with his pop singer wife, Carla Bruni, was raided by anti-corruption police within a few days of him losing presidential immunity from prosecution), so Hollande appears set on a course of unprincipled mediocrity. His relations with Qatar do not necessarily rule out his claim to be a socialist, but they certainly suggest he’s prepared to overlook it if the price is right.